It’s good to see WebRoots Democracy’s new report into online voting “Viral voting” incorporating an important recommendation for online voting to be introduced for union balloting as well as for parliamentary votes. It’s no surprise that so many people are turned off voting when some politicians seem so out of touch with the way people’s lives have changed and when they block changes that would make it easier to participate in democratic life. This is true at work, as well as in society. Compulsory postal votes for union members to take industrial action were introduced when the post was our main means of communication. Now, a lot of mail is junk mail or bills, and for many people life has moved online and onto smart phones. That’s why the TUC has argued for the right to use modern balloting methods (as the report points out, it’s something we’ve campaigned on since 2003). But the government has failed to grant union members the right to vote securely and secretly online. Most disputes are settled without strike action being necessary but balloting for action can be an important way to bring otherwise reluctant employers to the negotiating table. It is in everyone’s interest to ensure that that as many people as possible participate. But the government has saddled unions with twentieth century postal balloting methods that make it harder for working people to do just that. 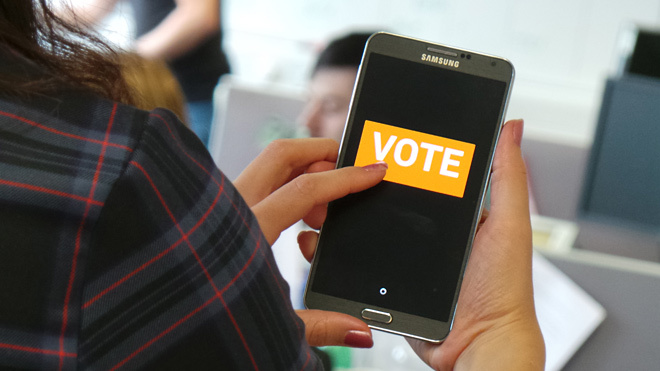 Online voting is the way to bring balloting bang up to date and help ensure some equality in the workplace. True democrats should add their voice to the campaign for the right to vote online – in industrial ballots, as well as political ones. Absolutely right, but our experience of on-line surveys etc in UNISON’s Local Government section is that low paid, part-time members are under-represented. Need to ensure that e-voting is not a substitiute tfor workplace meetings and organising around the issue too.